A brief illustrated introduction to a new style of twin headed MIG welding lathe – with dedicated production tooling for the manufacture of heavy duty welded steel conveyor rollers, based upon Edwin Lowe Ltd bearing housing cartridge technology. A general view of the twin headed welding lathe, which consists of a fixed headstock and a moving tailstock. In operation, the tailstock moves along the guide path upon the machined bed of the welding lathe – towards the fixed headstock. 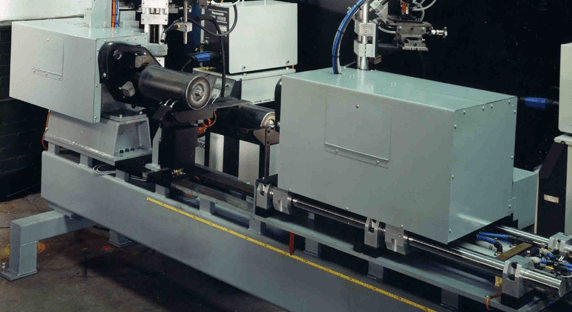 The tailstock is shown here moving up the bed slideway to engage the preassembled roller, which has been loaded onto the machine. Another general view of the machine – showing the complete machine bed. Illustrated here is the new style of twin element weld head tooling – designed specifically around the new concept of welding a preassembled roller. 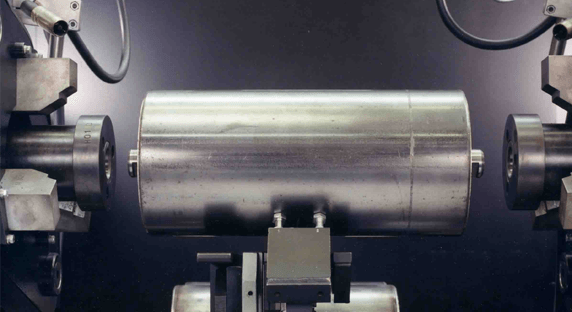 First element – external three point location tooling, conical in cross section – designed to locate the central axis of the tube against the central axis of the welding lathe, via the outer circumference of the tube – prior to the actual welding cycle. Provides physical support for the roller via the shaft over projections at both ends – during the welding cycle. Physically locates the central axis of the roller shaft against the central axis of the welding lathe – prior to the actual weld cycle. 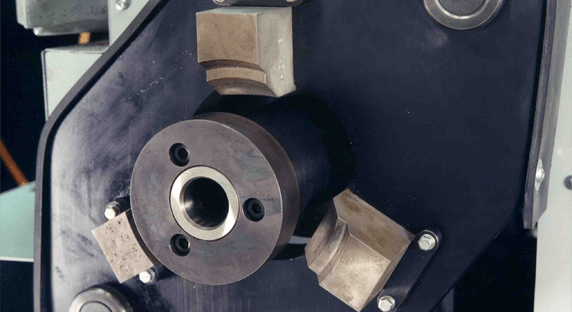 Securely clamps both bearing housing cartridges in situ against the prepared face of the roller tube – via the face of the bearing housing cartridge. Provides the motive power for driving/rotating the roller during the simultaneous application of the seamless weld at both ends of the roller, by the MIG welding guns. The preassembled roller has been mounted upon the welding lathe and the sequence of operations has commenced. The central tooling elements are advancing to pick up the ends of the shaft overprojections, to commence the production sequence. A closer view of the commencement of the production cycle upon the welding lathe – immediately prior to the preliminary cycle of the central tooling element. In this picture you will note that both the external and internal tooling on both of the weld heads are poised ready to pick up and align the central axes of both the roller tube and of the roller shaft -with the central axis of the shaft/welding machine. The preliminary location cycles are now completed i.e. 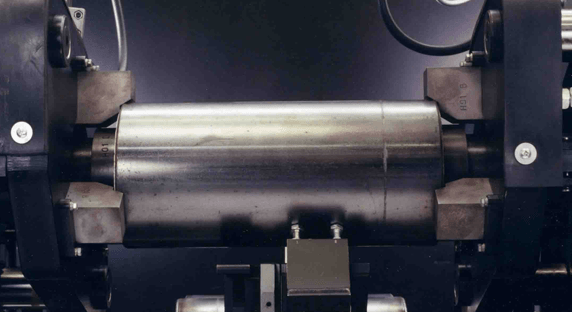 the cartridges are now firmly clamped in situ against the prepared ends of the roller tube. At the same time – the tooling on each of the two opposing weld heads has precisely located the central axes of the roller tube and of the roller shaft – against the central axis of the welding lathe. Therefore – the central axes of all of the components within the preassembled roller – have all now been brought into line with the central axis of the welding machine – and with the central axis of the roller itself. i.e. 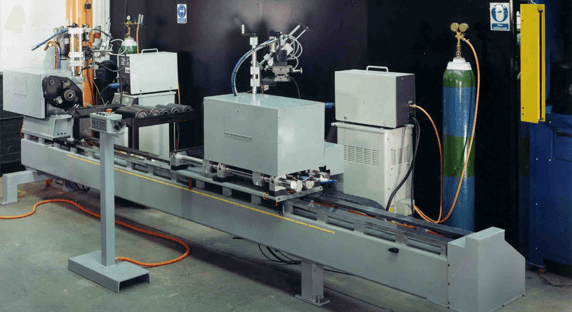 automatic alignment of all components prior to the welding cycle. The external tooling will now withdraw, the two MIG welding guns will come in and the continuous seam weld cycle will commence. The roller has now been clamped into position via the two central tooling elements, fixed to each of the two weld heads. 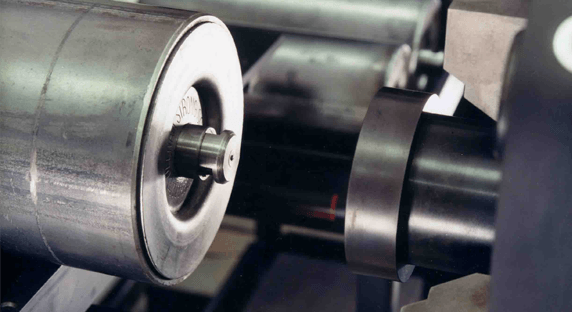 The roller is being driven by these central tooling elements – i.e. being rotated – while the two MIG welding guns apply a continuous seam weld simultaneously to both ends of the roller – around the weld machine central axis – thus welding the two Edwin Lowe Ltd cartridges firmly in situ – whilst still maintaining precise axial alignment. The completed roller is then simply ejected off the back of the welding machine to go into storage, or to go onto a subsequent assembly or packaging line.